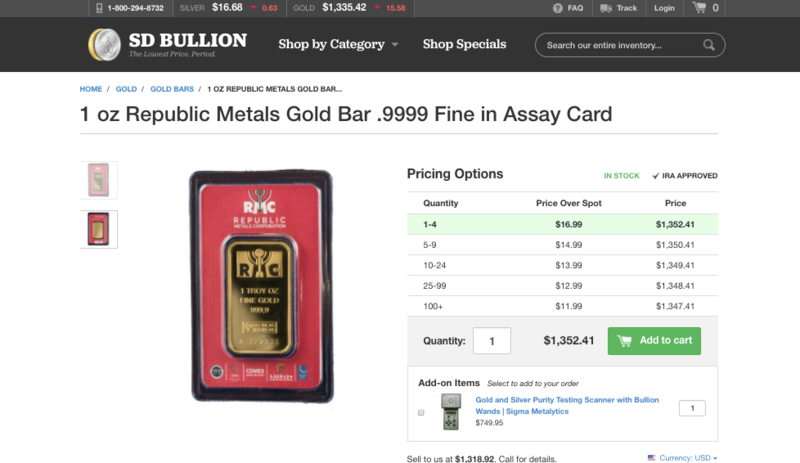 How to buy Gold Bullion at Wholesale Prices? Can you Buy Gold Wholesale? Yes, you can buy gold bullion at wholesale gold prices, but doing so will depend on a few factors which we will discuss here. When buying physical gold bullion from gold bullion dealers, the price you pay per troy ounce of gold will depend on (#1) the amount of gold bullion you are buying, (#2) the type of gold bullion products you are getting, and finally (#3) the then current supply-demand gold bullion product factors at play when you are making a specific gold bullion purchase. Virtually all private gold mints and government gold mints sell their physical gold bullion bars and gold bullion coins exclusively to gold bullion dealers. It is gold bullion dealers like us who then inventory, safely store, price hedge, market, buy, and sell gold bullion products at retail and wholesale prices to the general investing public. How we define retail gold bullion prices vs wholesale gold bullion prices is usually only a matter of a few percentage points difference, even sometimes mere basis points (typically less than a 1% difference). Our gold bullion business is contingent on high volume purchases and sales of gold bullion thus our gold product price premiums relative to the fluctuating gold spot price must be extremely competitive. More often than not we are the industry leader in low gold bullion price offerings. When you shop at online gold bullion dealer websites you often find tiered pricing structures. All gold bullion dealer sales (regardless of size) have fixed overhead costs associated, hence smaller dollar volume transactions will often have slightly higher price premiums compared to larger dollar volume purchases of gold bullion products. The following is a real life example of this point at work. Wholesale gold bullion coin prices vs wholesale gold bullion bar prices are often slightly different too due to the costs associated between acquisition and sale. For example there are varying government mint seigniorage fees, lower private mint manufacturing costs (typically more efficient than government mints), gold bullion product distribution costs associated, etc. The good news is that at the moment of writing this article (in early 2018), the physical gold bullion industry has currently some of the lowest premiums or gold bullion prices near the fluctuating gold spot price on record. Many secondary gold bullion products have been recently sold back to gold bullion dealers over the past few years as gold spot prices have gone sideways for some time now (this is a big reason why many government mints, like the US Mint for example, had lower gold coin sales in 2017 compared to virtually all years after the 2008 Financial Crisis). The ‘weak hands’ recently selling gold bullion products have helped drive current gold premiums to recent low points as second hand gold bullion product supplies have been replenished amongst many gold bullion dealers. More supplies with equivalent or lessening demand is the perfect recipe for lower price premiums on gold bullion products (either new or secondary products). We have even seen some gold bullion products being sold in small volumes even, either priced at or just above gold spot prices (1 oz gold bar sales priced at spot, not normal for our industry). These low gold premiums or prices at or just above gold spot price will change if past history is any precedent. As financial market volatility likely returns to close out this decade moving into the next (2020s) we fully expect increasing premiums on all gold bullion products as demand returns and possibly surges above what we experienced in the fall of 2008, when many gold bullion products were either sold out, unavailable, or backordered at high premium prices for months. 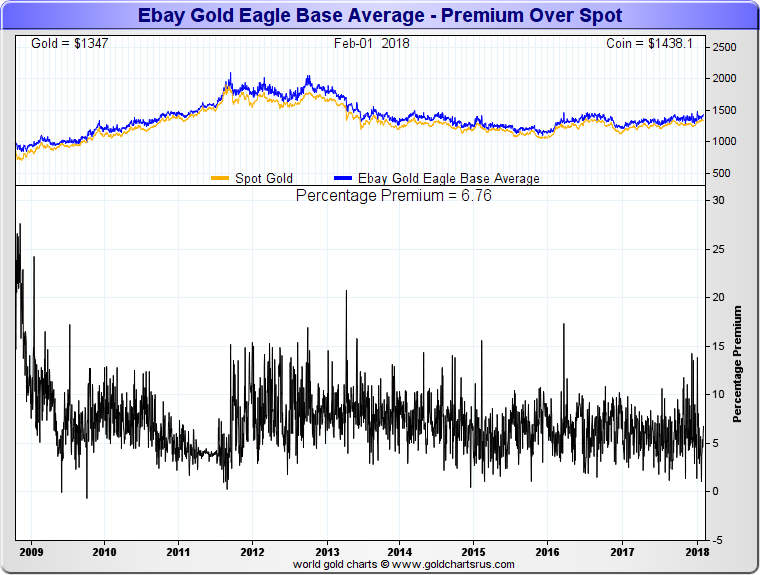 The following 1 oz American Gold Eagle Coin price data shows the ongoing premiums or price volatility for sales on eBay over gold’s fluctuating gold spot price. Note that common new brilliant uncirculated 1 oz Gold Eagle Coins cannot be acquired by the public directly from the US Mint. Gold Eagle coin sales on eBay are a mix between secondary and brand new coin sales amongst gold bullion dealers and private gold bullion coin owners. Notice too how during the financial crisis in the fall of 2008, not only did volatility spike on the US stock market but also price premiums for physical Gold American Eagle coin sales on eBay as high at 25% over the then flutuating gold spot price. This means that gold spot price was for example $800 oz yet the 1 oz American Gold Eagle coins being sold on eBay were priced over $1000 oz USD each. These most heavily purchased 1 troy ounce gold containing, 22k US government guaranteed gold coins can only be bought new by the public directly from gold bullion dealers. At a minimum gold bullion dealers acquire new 1 oz American Gold Eagle Coins through authorized purchases in 1,000 oz lots priced at 3% over the fluctuating gold spot price. Gold dealers then add a slight premium to the coins they purchase and then sell them to financial institutions and the investing public. Secondary sales of 1 oz American Gold Eagle coins can and do happen at prices lower than 3% over the changing gold spot price though, as illustrated in the chart’s data above (which again takes Gold Eagle Coin prices from both new and secondary sellers). Not all supposed sellers of gold bullion are honest nor safe to transact with. There is a long litany of examples of this statement documented by an industry whistleblower. As well for every allegedly corrupt gold dealer, there are also two bit gold criminal who use supposed low priced gold sales as a way to attract their victims. You must always be certain of the trustworthiness of the counterparty you are considering buying gold bullion from as counterfeit gold products from China often hurt potential would be gold bullion buyers driven only by lowest price point buying. We only deal in bonfide gold bullion products from private and government gold mints and guarantee all the gold bullion products we sell as the genuine articles. Any and all secondary products we buy from customers are also checked and verified legitimate using various methodologies to ensure no counterfeit products are ever introduced into our gold bullion inventories. Yet still today,the vast majority of the gold bullion products we sell are newly issued. Our suggestion: any gold bullion dealer you may consider working with we strongly suggest you confirm their latest customer reviews on hard to rig review websites like this one. Also be sure to dig into the Negative Reviews of any potential gold bullion dealers BBB page to see the nature and volumes of customer complaints as well how the gold bullion dealer handles any discrepancies which may occur from time to time (especially when they have tens of thousands of transactions per month like ourselves here). Be careful if the gold seller or gold dealer you are considering has no online track record at all. If you are ever offered gold bullion at prices below spot, then it is most likely a scam in waiting. Although antagonization may be entertaining, it’s probably best to ignore these potential crimes. Where can I buy Gold Wholesale? Where to buy Gold Wholesale? 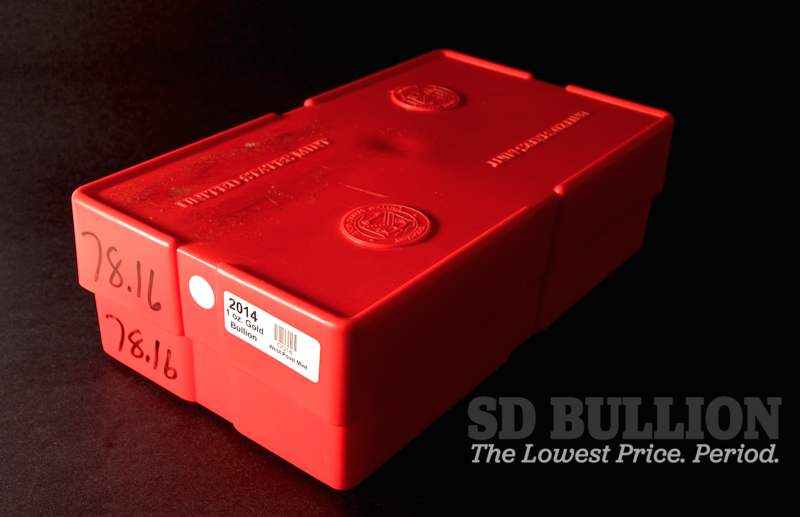 You can acquire gold bullion at wholesale prices from the largest high volume gold bullion dealers like ourselves here at SD Bullion. Again to achieve the your lowest price point over gold spot you will want to buy in high volumes and typically in the popular gold bullion products we carry which have vast and robust secondary markets, not merely here in the USA but around the physical gold bullion trading world. 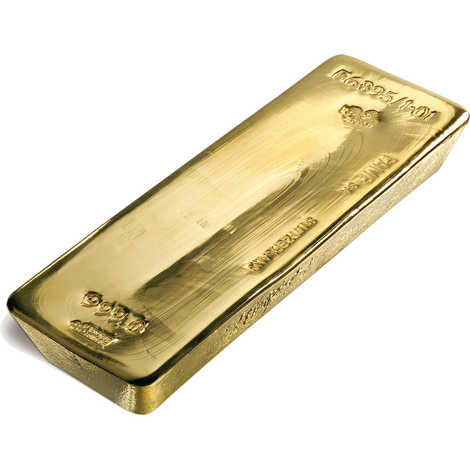 For example the 400 oz gold bars pictured below are cast in Switzerland. Likely they represent the lowest gold price one can acquire over gold's fluctuating spot price for those parties thinking of allocating high seven to eight dollar figures into gold bullion. The 400 oz gold bars pictured above are typically the size gold bars used by governments and their central banks, as well high net worth investors and financial institutions. Just two of these gold bars represent over one million US dollars in value currently. 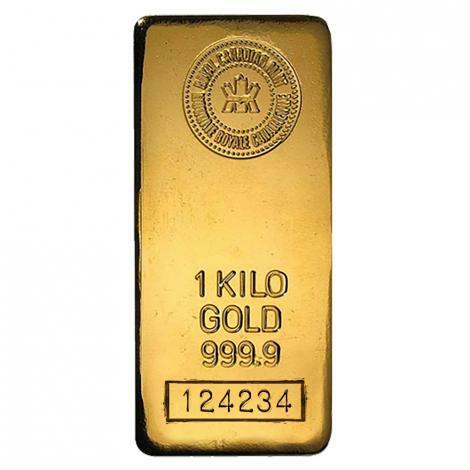 The two gold kilo bars pictured below are cast in the USA and Canada respectively. Likely they represent the next level lowest gold price one can acquire over spot for those parties thinking of allocating large dollar figures into gold bullion. Gold kilo bars are becoming the new standard for eastern central bank and gold futures market trading (e.g. Shanghai Gold Exchange). In this 21st Century Gold Rush, smaller sized one kilo gold bars (private and government minted) have become the standard preferred by China and the largest physical gold bullion exchanges (SGE). 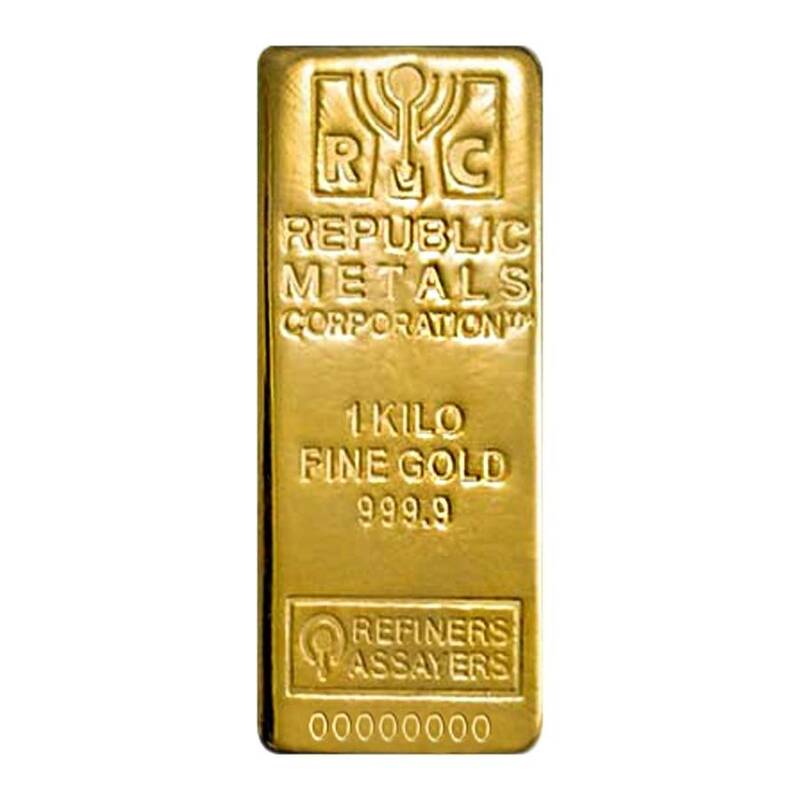 On top is a Republic Metals Corporation 1 kilo gold bar, and below is a Royal Canadian Mint 1 kilo gold bar. Both have a guaranteed minimum 32.15 troy ounces of .9999 gold content. How do you Buy Gold Wholesale? 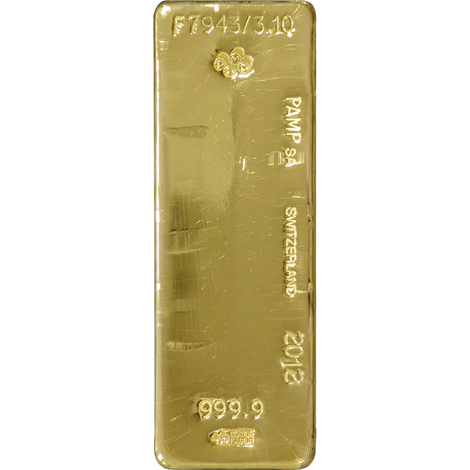 You can buy gold bullion at wholesale prices either in heavy volume through our website or over the phone with us here. Our highly trained experienced staff can help answer your specific gold bullion product related questions including product choice preferences, delivery options, etc. We can even help you set your very own direct professional non-bank secure logistics long term gold bullion storage account domestically (and even internationally if desired). Many of the gold bullion storage firms we work with have been in the bullion safekeeping business since the 1800s. We are committed to helping you make your best wholesale gold bullion buying choices combining low prices, long term storage safety, with your best interests and buying perimeters fully considered. For further educational information on gold bullion buying and investment factors, visit our 21st Century Gold Rush Guide page for more free content.